Yesterday, I was eating lunch and noticed a young girl watching something intently outside of the window of the restaurant. I was curious about what it was, so I went over to the window myself. She was watching a small grey mouse under a flowering bush. "She reminds me of Mrs. Frisby," I told the girl. She then asked,"Who is Mrs. Frisby?" "She is the main character of one of my favorite books, Mrs. Frisby and The Rats of NIMH. Have you ever read the story?" I questioned. "No." replied the little girl. Her mother then interrupted, "We should try it for a summer reading book." I couldn't have said it better. This children's book, written by Robert C. O'Brien and illustrated by Zena Bernstein, was published in 1971 and won the 1972 Newbery Medal. It is the tale of a widowed mouse, Mrs. Frisby, working to save her son Timothy's life. He has come down with some type of respiratory illness. 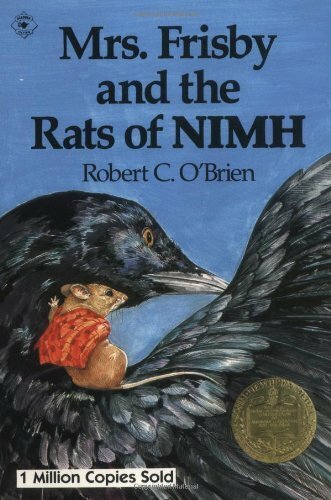 While searching for a cure and the time for his convalesence, she meets many unexpected heroes: an old white mouse, Mr. Ages; a crow, Jeremy; a wise old owl; and an entire colony of rats, including Justin and Nicodemus. And, what story of adventure would be complete without a common enemy? In the case of the inhabitants of Mr. Fitzgibbon's farm, the enemy is the farm cat, Dragon. This book is perfect not only for a family read aloud but for any middle reader, (3rd-6th grade) to read independently. The animals are the characters, so keep that in mind as you think about whether it will appeal to your reader. Fun is the goal...so read away.